Soon after Microsoft announced the stripped-down Windows 10 S version, alongside the Surface Laptop, partners have introduced their first notebook variants running on the education-focused software. HP has introduced the ProBook x360 eEducation Edition and Acer has introduces the TravelMate Spin B1 – both running on Windows 10 S. Both the laptops have been launched earlier, and the hardware remains the same, but the software in it is the new Windows 10 S, and the price tag is much cheaper. Starting with the HP ProBook x360 Education Edition, the rugged device has a 11.6-inch (1336×768 pixels) display powered by an Intel Celeron processor, 4GB of RAM, and 64GB of storage. This laptop was launched in December last year, and was made with schools and students in mind. The company touts the new ProBook x360 Education Edition to be military standard certified to withstand accidental spills and drops by kids. It has a 360-degree hinge to rotate completely into a tablet, or even a tent stand for ease of viewing. Furthermore, there’s a dual camera system which uses a 1080p HD camera embedded in the keyboard to let users take video in tablet mode as well. There are two USB 3.1 ports, one USB Type-C ports, one HDMI 1.4b port, one AC power connector, and one 3.5mm audio jack. The company claims that laptop can stay active for up to 11 hours of school activities and homework. The Windows 10 S version will retail for $299 (roughly Rs. 19,200), and is available in select stores right away. 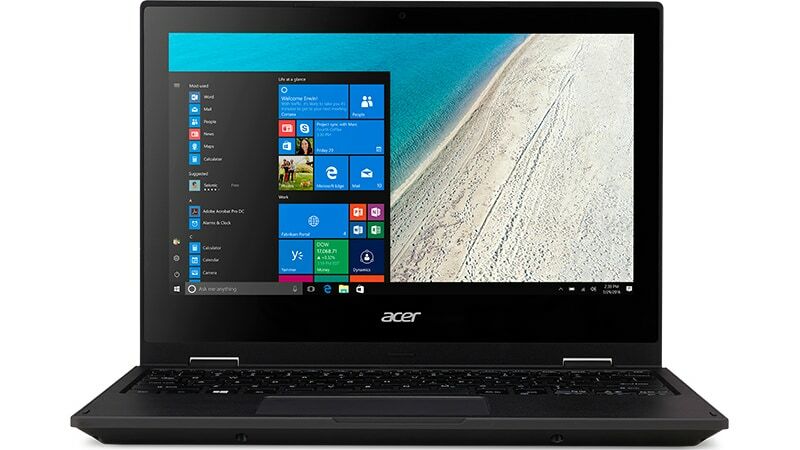 The Acer TravelMate Spin B1 convertible has a similar 11.6-inch (1920×1080 pixels) display, is powered by an Intel Celeron processor, 4GB of RAM, and 64GB of storage. The laptop also has a 360 degree hinge, and comes with a stylus as well. Connectivity options include a dual-band 802.11ac 2~CHECK~2 MIMO Wi-Fi, Bluetooth 4.0, a GbE port, USB ports, a webcam, an SD card reader, a touchpad, and a spill-resistant keyboard. The Windows 10 S variant is priced at $299 (roughly Rs. 19,200) as well, and is available in select retail stores in the US and online as well. Dell and Asus are also set to launch their own education laptops in the US market soon.